Abcam’s GOLD Conjugation Kit (60nm, 20OD) (ab188216) allows antibodies or proteins to be covalently attached to ultra-stable* Gold nanoparticles at very high OD quickly and easily. The hands-on time for the Gold conjugation procedure is about 2 minutes and the conjugate is ready to use within 15 minutes. *Gold has a protective surface coat that can withstand the most extreme conditions (e.g. 2.5M NaOH at 70°C for >1 hour). The Gold nanoparticles in this kit are supplied as a freeze dried mixture. The conjugation reaction is initiated simply by adding a solution of the antibody, which becomes attached (via lysine residues) to the gold surface. The resulting covalent conjugates are more stable than those prepared by passive adsorption methods. Moreover, unlike passive methods, the coating procedure is not dependent on the isoelectric point of the antibody, and extensive trials at different pH values are not required; all antibodies react at a single fixed pH. 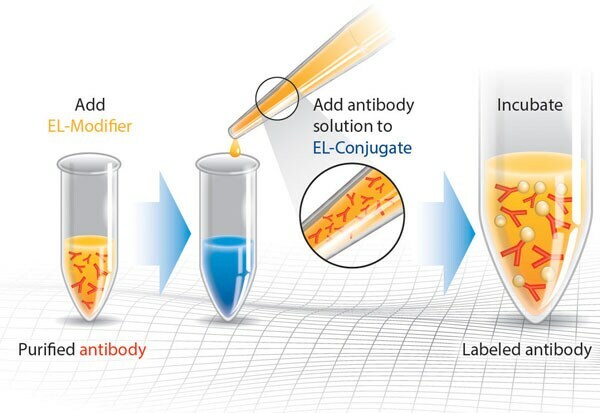 The 3 and 10 Test Conjugation Kits are designed to label 12 µl of antibody per vial. The 1 Test Conjugation Kit is designed to label 120 µl of antibody per vial. Our Abpromise guarantee covers the use of ab188216 in the following tested applications. Publishing research using ab188216? Please let us know so that we can cite the reference in this datasheet. There are currently no Customer reviews or Questions for ab188216.